A promising new tool for cancer therapy may be bacteria engineered to attack tumor cells, according to a review article recently published in the journal Nature Reviews Cancer by CSUN Biology Professor David Bermudes, with colleagues at the Johns Hopkins University School of Medicine, Albert Einstein College of Medicine, and the FDA. Pathogenic bacteria have a variety of mechanisms by which they damage human cells and tissues; but if they can be engineered to reduce their virulence to non-cancerous tissues and to more specifically target tumors, these mechanisms may be coopted for anticancer therapy. The authors review recent work on the use of genetic engineering techniques to reduce bacterial virulence, the possibility of improving bacterial strains’ tumor-specificity, and prospects for engineering bacteria to synthesize and deliver “payloads” of anticancer agents when they have established in a tumor. Among the research synthesized in the article are projects by CSUN Biology alumni David Quintero, Jamie Carrafa and Lena Vincent. The full article is available online from Nature Reviews Cancer. 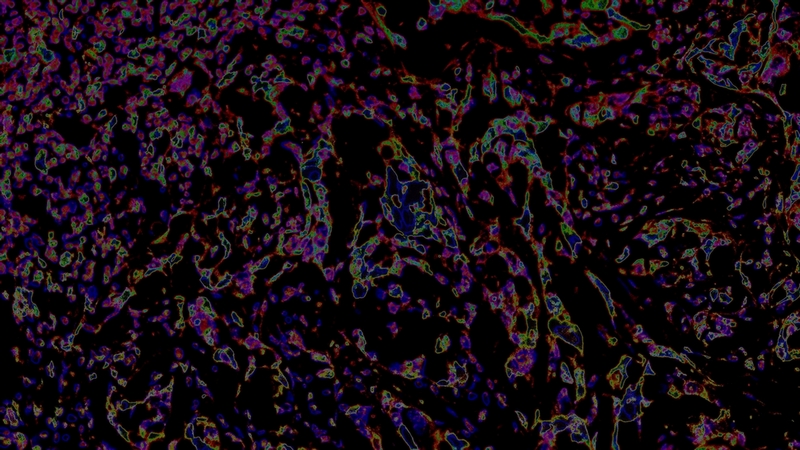 Image: Modified visualization of an IF-stained tumor section (Courtesy of the Kelber Lab).